Generally speaking, sellers offer more of a good at higher prices than they do at lower prices. 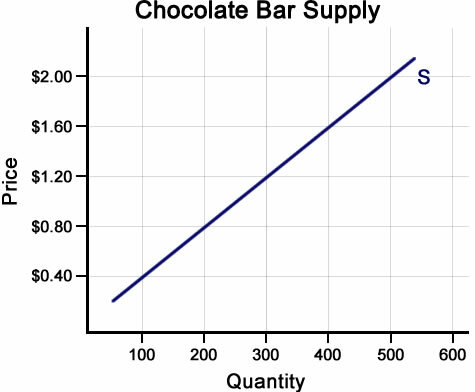 When this relationship is graphed, the result is an upward-sloping supply curve. A change in the price of the good or service results in movement along the supply curve from one point to another. This is called a change in the quantity supplied. When factors in the market for the good or service change, the supply curve shifts to the left or the right. This is called a change in supply. Of course, supply is only one side of the market. The other side is demand. When we put supply and demand together—when buyers and sellers interact—we get market equilibrium, which is the topic of our next lesson.